Recently one of my friend who work in the maintenance field sent me a switch mode power supply board for repair. This SMPS board comes with a control board for controlling display. The complain was no power and the fuse blown into a very dark color. There must be some components that had developed a direct short circuit that could have cause the fuse to turn into black and by replacing the fuse only will not solve the problem. My next step was actually to use a series light bulb trick but have decided to just scan from above to see if there is any visual indication of components blown. Scanning from above i could see the varistor have some problem. After taken out the part and check with ohmmeter and found that it was totally shorted. As usual one have to check for any corresponding parts first before you put back a new component and power On it. I have tested the bridge rectifier, power fet and check the big filter capacitor and components in the EMI filter circuit and found all of the components to be good. Conclusion, this switch mode power supply problem was caused by only a shorted varistor and a blown fuse. The indicators (LED’s) in the controller board lit proof that the power supply was working fine upon power On. Yes at 10X KOHM it will output 12 volt. hey there jestine,on that post above about the analog meter,how can that meter output 12v @10xk ohm when the meter only has 2 AA batterys in it at 1.5 volts each? just curious ,mark s.
You have to make sure the meter has x10 k ohm range. If the meter has x10k ohm range this mean the meter internal is using 2 x 1.5aa battery and a piece of 9 volt battery. i understand now jestine,also how do you test a 4 pin optocoupler,i know how to test the led side,(reading in only one direction) but how do you test the photocell side?? For any switching regulator ic, just check the supply voltage and measure the waveform of the output. You need a datasheet to do this. 78r09 has an additional pin. Check the datasheet and make sure the control pin have some voltage so that the output can be produced when there is a supply voltage to the input pin. The control pin act as a switch and usually the control signal is coming from MCU. many thanx jestine,thing is im learning by removing most components to test them,im working on a samsung power supply at the moment,that just will not power up,standby voltage is there,when you press the remote power on the red light goes off,when you press the power on buttons on the tv,they are not ,responsive,all the caps test good on esr and capacitance,resistors all good,diodes test good,viper12a pwm chip replaced ,also a F9222L 13 PIN CHIP,transformers tested good with my blue ring tester,all the transistors on heatsinks tested on my peak atlas dca meter have been recognised so assume no faults there,i can hear the pwm chip hiss then it clicks repeatedly every few seconds,but still no output voltages,ps-on voltage is there,voltages are up and down in sync with the pwm chip hiss and click,the psu is a BN44-00158A,http://monitor.espec.ws/files/158_109.jpg,REALLY STUMPED ! Your case seems to be the standby problem. You may need to check if the CPU is getting the right supply voltage and make sure there is sinewave in the cpu crystal. When you press the remote or the on button the CPU has to output an on signal to the power side through optoisolator IC or a relay (through a driver transistor). If the CPU, relay or any component in the optoisolator circuit is bad then the primary power side will not be energized. From the pins result I can't make any conclusion unless I have the schematic. Since you mentioned that the PS-ON have voltage then try to trace where this line goes. I presume that it will end up in the optoisolator circuit. If the optoisolator circuit have bad component/s then the PS-ON signal can't turn on the photo transistor in the secondary side of the optoislolator ic. This in turn no full power will be output and the standby light remains red. do you mean trace back the ps-on signal on the main board? and check components around there?,or on the psu?,when first plugged in the tv will have its red standby light on,when remote button is pressed to turn the tv on the red light will go off (samsungs do this apparantly ,normal),i used your trick with 2 analogue multi meters joined together to test optoisoltors and they give a reading only one way ,which is good.should the detect pin have voltage on it?,or does the main board supply that voltage when tv is turned on?. The CPU should send an on signal to the optocircuit (assuming if the CPU is good) and you could see some slight changes in voltage in the opto LED anode pin. Before that did the power IC in the main power supply getting any supply voltage? i removed the sheilding where i think the main cpu is,but it is one of those chips where you cant see any pins showing so i could test to see if there was voltage getting to the cpu,it is a chip where the tabs of the chip are underneath the chip,when you say the main power ic ,do you mean the 8 pin smd chip that is on the solder side of the psu?,the only other chip which is 8 pin is the pwm chip on the component side of the board ,(viper12a dip8) this one has been replaced, i think this chip deals with the standby section? It depends on the design and yes some main power chips have it soldered from behind and it was a small 8 pins smd chip. You need to check the part number to double confirm. In other words the sub power supply has to function first and turn on the CPU before CPU sends out another signal to turn on the main power supply. I suggest that you check all the components first before you replace and turn on the printer. Check if secondary side diodes shorted or not. Could you confirm if the resistor is 22 ohm or 0.22 ohm? I have a problem with a wii remote. Does not work. I did voltage testing from battery which is 3V. I continued testing and found voltage on smd resistor 3V. After the resistor the supply goes through a smd capacitor on the + line. On the one side of the cap the voltage reads 3V but on the other side of the cap the reading is OV. Does that mean the cap is open circuit? I checked the cap with multimeter and shows open circuit. If the cap is located in the supply line it suppose to work that way because the cap one pin is connected to vcc supply line and the other to ground. To check the cap you need digital capacitance meter and to check electrolytic capacitor you need ESR meter. Just use the ESR meter and measure across the two pins of the SMD e-caps. If it is a non polar caps you need to remove and test it with a digital capacitance meter. I am working on HP Compaq Evo D510 Power Supply. 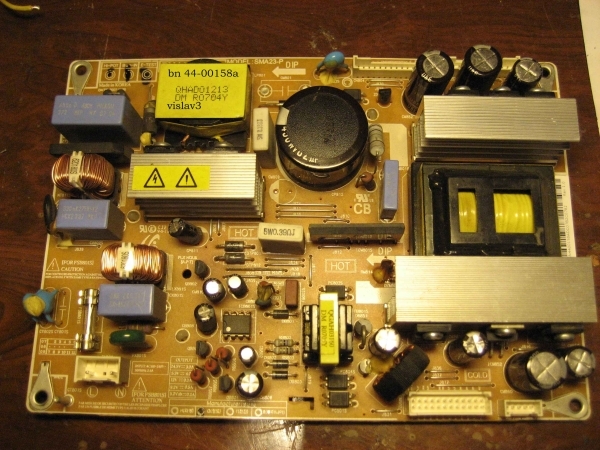 You can view this power supply on this link http://webdevsys.com/d510psu.htm. I think you have worked on it. In this power supply I checked on primary side where voltage on filter capacitor is ok. I check other components on primary side with oscilloscope. I got same wave form on both terminal of capacitors. There is no voltages on secondry side. Kindly help me. I have not repair such model before but almost all computer power supplies are the same. In your case have you check all the components in the primary side? check also for shorted secondary diode. Make sure the power supply is connected to the original board. If this power supply is using power ic then have you check what is the supply voltage to the power ic? Sometimes it can be corrupted eeprom data that could cause not charging or charging led error. Sir I checked it and found that there some parts are missing. Sir without schematic how can I solve this issue. I don't have any other supply like it. What to do ? Without a schematic it would be very tough! Replace all parts smps run well but output voltage is only 7.5 ,what the problem on ? Have you direct replace the low ohm resistor (maybe 0.22 or even o.33 ohm). What about filter cap at the 12 volt-have you checked it? Hi jestin , what is the filter used for that connect across the smps tansformer pri and sec GND, and if it is deffective what are the symptom? For main isolation purpose. Some power supply will have no effect on the output. However to some, it could cause some minor disturbance in the output causing the monitor display to have some sort of small wavy lines across the display. Hi Justine, in that smps only one resister fuse out it value is only 48 ohm and it replace wall, next one low ohm ( 8 ohm) used in opto. section it is not bad . Sorry I don't get your question. Could you send some photos to jestineyong(at)electronicrepairguide.com (at) means @. I'm not sure what will be the output voltages. You need to test it with your dc voltmeter. I guess this could be a special type of power supply and not easy to locate the schematic. Sir Jestine Thanks you for your Sharing learning Articles. i do lot of learn and get knowledge about that. however, i have some problem in repair power Supplies. please guide me and refer easy way to clear mis-understandings with SMPS Repair. why desktop computer smps fuse and ntc damage ? ¿any clue on what is happening? If the power supply is switched to 115 volt with 230 v input, most of the time the components inside will blow but I guess this design could have the protection circuit preventing the components from blowing. If the power supply is running on a 230 volt but you only pump in 115 volt this means it received less voltage and full power can't be produced. To solve the problem just give what the power supply need. If it is a 230 volt power supply then supply 230 volt input. Although I have not come across such problem, I believe the problem could be an open resistor in the primary side that is nearby to the two big filter capacitors. Or try check all the components in that circuitry. Decayed glue could cause problem to electronics circuit. Hope to hear good news from you. i have some problem in smps. 24 volt and 5 volt, both the output fluctuats. please guıde me. Have you checked all the e-caps with esr meter? What about the components in the opto ic area. I am working as GET in smps production company.Here they are testing zebronics smps.How may i gain knowledge and how should i learn.Give some suggestions so that i can learn in better way.